2018 FIBA WWC: D’Tigress Lose 73-72 To Canada, Finish 8th – Royal Times of Nigeria. Nigeria’s D’Tigress finished eighth at the 2018 FIBA Women’s World Cup in Tenerife Spain after they lost Canada seventy-thre-seventy-two to Canada in a classification game on Sunday. It was D’Tigress’ third straight loss for in at the tournament. The reigning African Champions narrowly lost the first quarter twenty-one-seventeen but bounced back to win the second quarter eighteen-nine. In the third quarter scores were tired at nineteen-nineteen. 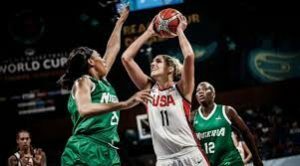 The Canadian girls opened a seven-point gap in the fourth quarter, and with their pace, they kept their nerve from the throw line, denying the Nigerian team a chance to overtake them late in the game. However, Nigeria will be more than happy with an eighth place in the world as it is the best ever finish for a team out of Africa.